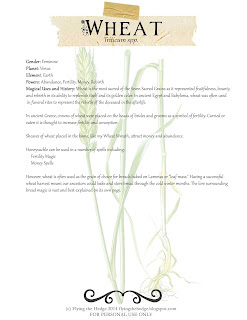 Magical Uses and History: Wheat is the most sacred of the Seven Sacred Grains as it represented fruitfulness, bounty, and rebirth in its ability to replenish itself and its golden color. In ancient Egypt and Babylonia, wheat was often used in funeral rites to represent the rebirth of the deceased in the afterlife. In ancient Greece, crowns of wheat were placed on the heads of brides and grooms as a symbol of fertility. Carried or eaten it is thought to increase fertility and conception. Sheaves of wheat placed in the home, like my Wheat Wreath, attract money and abundance. However, wheat is often used as the grain of choice for breads baked on Lammas or "loaf mass." Having a successful wheat harvest meant our ancestors could bake and store bread through the cold winter months. The lore surrounding bread magic is vast and best explained in another post. Want to print a copy of this for your Book of Shadows? Click below for your free copy!